Why? Because it’s pretty much all you need to do journalism – it browses the internet, sends emails, makes calls, records audio, takes fantastic photos and records incredible video. It’s a media production machine. I’ve heard of at least one freelancer who wrote entire features for almost an entire year using just an iPhone (more on that in a future blog). The best thing about it is the quality of the images it can make. More than that, it’s the ease and convenience of it that puts it head and shoulders above everything else. iPhone photos have graced the likes of Time magazine (front cover! ), New York Times and much else besides. Conflict photographer Ben Lowy uses it almost exclusively and he’s covered Afghanistan, Libya and the Arab Spring. Videojournalism? Guardian reporter Adam Gabbatt uses an iPhone to make short video reports which you can see here and here. The Guardian’s SE Asia correspondent Kate Hodal interviewed Suboi, Vietnam’s first mainstream female rapper: “I interviewed her and she gave me an exclusive freestyle, which I caught on my iPhone and then uploaded to our editors in London”. If you are going to make a video report however, do invest in an external mic – that is extremely important. You want decent video and audio. Some sort of tripod/monopod for it would be very handy too. The Microsoft Surface RT is a great productivity tool for journalists. It is much lighter than most laptops, coming in at 676 grams (the Macbook Air in contrast weighs 1.3kg), and has a battery life of 8 hours. Why get this tablet rather than an iPad? Two words: Microsoft Office. 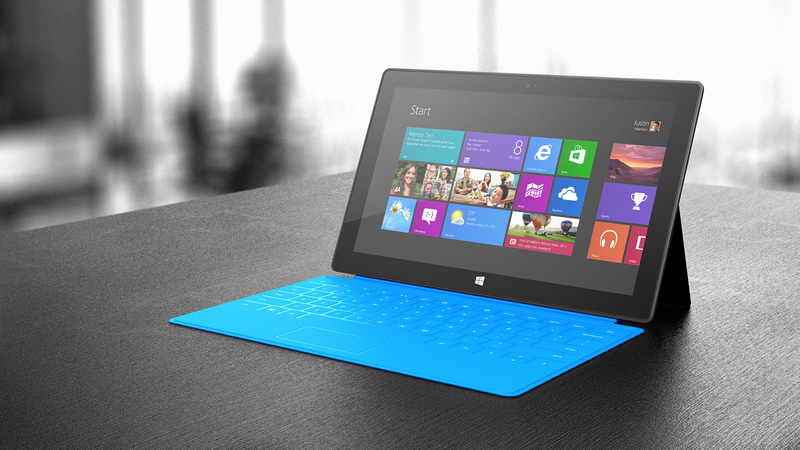 Apart from being cheaper than an iPad, the Surface RT unlike all other tablets has Microsoft Word. You’ll want the optional touch/type covers – which click in magnetically – to do any serious typing work. Yes it doesn’t have anywhere near the amount of apps Apple and Android tablets have, but so what. They are distractions you don’t need. You have the internet, email and Word (plus a front-facing camera for Skype calls) – what more do you need as a journo? You have a smartphone anyway for those apps. Another benefit is that you can split the screen in half – so on one side you can browse the web, while the other is on Word for example. There are two Surface machines. The RT, pictured above, is the cheaper, lighter and smaller version, and runs a custom RT operating system. The Surface Pro is much more powerful (on a par with high-end ultrabooks), much heavier and runs Windows 8, meaning you can install any/all programs you currently run on a normal laptop. Most gadget reviewers say get the Pro, but I prefer the simplicity of the RT and of course it’s a lot lighter and much less pricey. UPDATE: The Surface 2, an update to the RT, is to be released later this month. It’ll feature an upgraded processor, screen, back and front cameras and a kickstand that is more adjustable. The Surface 2 will retail for £70 more than the RT, at £349 (for the 32GB version). Panasonic GH3 – a much better choice than a Canon 5D Mk 3, especially for video. This digital camera takes higher-quality videos than a Canon 5D Mk3. And it is well over £1000 cheaper. Here’s an excerpt from DPreview.com’s review of the camera: “The enthusiastic and largely unanticipated response to the GH2’s movie capabilities by working videographers (Google ‘GH2 video hack’ to get an idea for how keenly its capabilities are being exploited) has meant that Panasonic must now also consider that its camera is being integrated into professional video rigs”. Needless to say it also produces great photos, and for video there is simply no equal. The sensor inside the camera will be much larger than most dedicated video cameras. And while it won’t quite be able to beat the Canon 5Ds for low-light capability, it does have better video features, frame-rate options and better detail at 1080p HD levels. For the aspiring video journalist interested in producing films with professional-level picture quality, look no further. Not exactly a gadget but for someone whose profession is the creation of words, the pleasure of putting pen on paper should still be paramount. I bought my first pocket-sized moleskine last year and I’ve loved the aesthetic, the pages are crisp and a joy to write in. The dimensions are perfect and the pocket in the back is great for storing business cards and cuttings. I recently purchased the larger moleskin (pictured) and I have to say I like it even more. A4-sized notebooks still have a place in my stationary, particularly for taking telephone and face-to-face interview notes, as well as for diagramming article structure plans. But for the simple pleasure of writing and jotting down ideas, the larger moleskin has perfect weight and dimensions. « What exactly is a freelance foreign correspondent? Thanks for the comment jerrylazar. That app sounds good, especially if it allows audio monitoring as you say, a very important thing in order to see if the audio you’re picking up is decent of course. Unfortunately I am not currently in possession of an iPhone (I’m much too poor for that), but when I get one I’ll be sure to try it out!